WHAT INFORMATION DO YOU NEED FROM ME WHEN I SCHEDULE A TRANSPORT? Murphy Medical Transport does everything else. We provide a worry-free transport for you so that you can concentrate on other important matters. HOW FAR IN ADVANCE DO I NEED TO SCHEDULE THE TRIP? Please provide as much notice as possible but we realize things come up quickly. Call us at 707-425-0100 and we will do everything we can to meet your needs..
WHAT KIND OF TRAINING DO YOUR DRIVERS RECEIVE? After passing a background check and drug screening, our Client Advocate Drivers receive a two week orientation with one of our managers. They are trained in methods for safely lifting and moving patients, as well as in deep cleaning and disinfecting procedures. They receive training in the use and care of all of our equipment including our power driven gurney system. All drivers are certified in CPR/AED and First Aid. WILL I GET THE SAME DRIVER IF I GO TO MY DIALYSIS TREATMENT THREE TIMES A WEEK? We understand and value the relationship our Client Advocate Drivers establish with our long term clients. We will do everything in our power to facilitate your request. Please understand due to our busy schedule this cannot always happen. CAN MY FAMILY MEMBERS RIDE WITH ME TO MY APPOINTMENT? If requested at the time your appointment we will make every effort to accommodate your request. IT’S IMPORTANT FOR ME TO BE ON TIME FOR MY TREATMENTS. ARE YOU ON TIME MOST OF THE TIME? We take pride in our “on-time” percentages. We run a very dynamic schedule, making many revisions during the day to maintain our performance standard. However, unforeseen circumstances like delayed appointments, traffic and weather can alter our schedule. MY FATHER WEIGHS OVER 300 POUNDS. DO YOU HAVE A WEIGHT LIMIT FOR YOUR TRANSPORTS? We can accommodate patients of all sizes. We maintain a supply of bariatric equipment, including wheelchairs and gurneys that are rated up to 700 pounds. We are have a Hover Mattress system for patient movement that uses forced air to assist in moving clients from one flat surface to another. Absolutely! We wouldn’t have it any other way. We are fully insured through Pacific Diversified. WHAT DO YOU DO IF THERE IS AN EMERGENCY DURING THE TRANSPORT? Our Client Advocate Drivers will find a safe place to pull over and evaluate the situation. They then will contact the appropriate agencies. 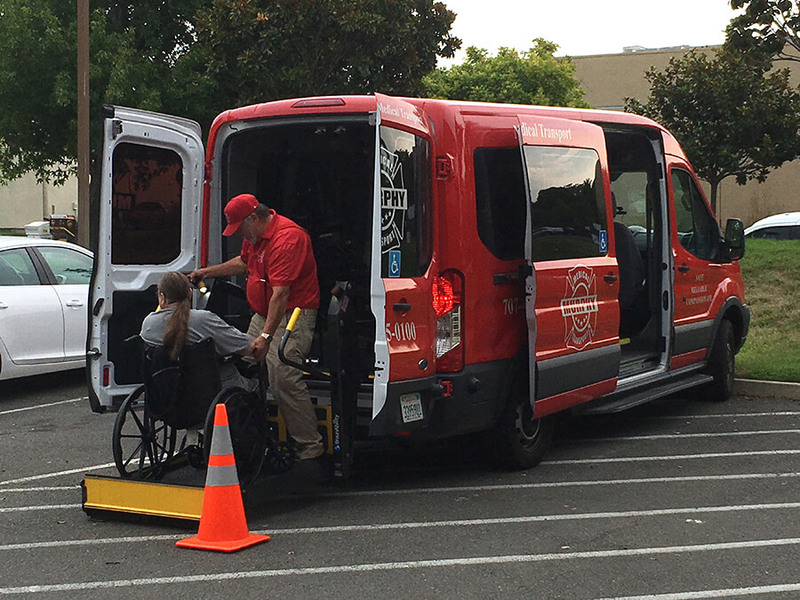 Our Client Advocate Drives are certified in CPR and First Aid and they will provide care and support until more advanced care arrives. Our administrative team will then make every effort to contact the client’s loved one and assist with reuniting them. MY MOTHER DOESN’T SPEAK ENGLISH. DO YOU HAVE DRIVERS THAT SPEAK OTHER LANGUAGES? Yes! We a few employees that speak multiple languages. We of course will also rely on family members and friends. Let us know at the time you book your appointment. HOW DO YOU SECURE THE WHEELCHAIRS IN YOUR VEHICLES? We utilize one of the safest and most modern systems available. Both the wheelchair and client are secured with a five to seven point restraint system. CAN WE TIP OUR DRIVERS? Our Client Advocate Drivers are not allowed to take tips. However, we would appreciate your feedback in our “Comments” section. IS THERE A WAY FOR ME TO COMMENT ON THE SERVICE I RECEIVE? We welcome all comments. We like to recognize our staff when they do a great job. We will also use your comments and concerns to help improve the services we provide. Please Please Click here to comments to provide feedback.